Molly Murphy—now Molly Sullivan—is a year into her marriage, expecting her first child, and confined to the life of a housewife. She's restless and irritable in the enforced idleness of pregnancy and the heat of a New York summer in 1905. So when a trip to the post office brings a letter addressed to her old detective agency asking her to locate a missing Irish serving maid, Molly figures it couldn't hurt to at least ask around, despite her promise to Daniel to give up her old career as a detective. On the same day, Molly learns that five babies have been kidnapped in the past month. Refusing to let Molly help with the kidnapping investigation, Daniel sends her away to spend the summer with his mother. But even in the quiet, leafy suburbs, Molly's own pending motherhood makes her unable to ignore these missing children. What she uncovers will lead her on a terrifying journey through all levels of society, putting her life—and that of her baby—in danger. 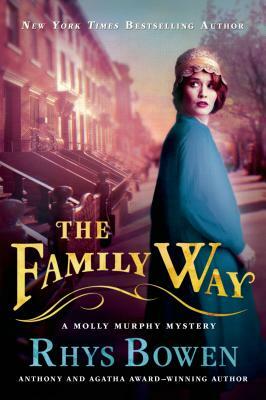 The Family Way, the latest entry in Rhys Bowen's bestselling Molly Murphy series, will delight fans and win over newcomers with its elegantly plotted mystery, atmospheric historical detail, and vivid characters. Rhys Bowen is the author of the award-winning Molly Murphy and Constable Evans mysteries. Her novels have garnered an impressive array of awards and nominations, including the Anthony Award for her novel For the Love of Mike and the Agatha Award for Murphy’s Law. Her books have also won the Bruce Alexander Historical Award and the Herodotus Award, and have been shortlisted for the Edgar, the Agatha, the Macavity, the Barry, and the Mary Higgins Clark Award. She has also written Her Royal Spyness, a series about a minor royal in 1930s England, and she is the author of several short stories, including the Anthony Award–winning “Doppelganger.” Her story “Voodoo” was chosen to be part of the anthology of the best of 50 years of Alfred Hitchcock Mystery Magazine. Ms. Bowen was born in Bath, England, and worked as an announcer and studio manager for the BBC in London, before moving to Australia and then California. It was here she started writing children’s and young adult novels, and then moved on to mysteries with the Constable Evans novels. When not writing she loves to travel, sing, hike, play her Celtic harp, and entertain her grandchildren. She lives in San Rafael, California.